Casa nel Cielo (House in the Sky) by Purini. Two noteworthy shows only begin to redress our neglect of an important figure in the Italian avant-garde architectural scene of the 60s­­ and 70s. In his short introduction, Kenneth Frampton writes, “In all the various aspects of his long and productive career, Franco Purini …is both known and unknown.” These shows, Franco Purini: In the Space of Drawing: Reason and Imagination, at Cooper Union, curated by Steven Hillyer, and Drawings of Invention at the Center for Architecture, curated by associate professors Giovanni Santamaria and Charles Matz, sponsored by the School of Architecture and Design at NYiT, present an extraordinary selection of the multi-faceted drawings of this prolific and indefatigable architect. The sensitive yet incisive drawings on view represent contemplative, intimate meditations on the origins and meaning of urbanism and architecture. Seen in relation to his projects, whether realized or not, they provide insights into design process and general philosophical posture of this soon to be better-known architect. Purini, like others of his generation, utilized drawing–the old-fashioned method–pen or pencil in hand–to give form to their ideas. These “Visionary Architects” deployed graphic means to express their hopes for a new approach to architecture, each developing his or her own language to generate images that would lead to new modes of thinking about our built world and its relation to nature. Their goal was to suggest the capacity of architecture to become a vehicle for apprehending the force of history and to suggest possibilities for a better future. Many of these works on paper, such as those of Michael Webb and Ron Herron of Archigram, were never intended to be realized. In Purini’s case, he maintained a steady habit of drawing that nourished and spurred his astonishingly prolific production. One can detect profound correspondences between his drawings and related buildings such as Torre Eurosky. And the graphic works reiterate his approach that is characterized by a bold clarity and punctuated by unexpected elements that provoke a new reading of the project. Despite the recognizable hand and eye, one notices several modes of expression. Particularly beautiful are the drawings that conjure panoramic or distant projections of small urban areas set within a larger landscape, such as the drawing for Terracina. This elegant rendering reveals how territory and topography contribute to an understanding urban issues. Many also function on a poetic level – somewhere between a literal exposition of a theme and possible inflections or permutations of a concept. In drawings such as Landscape and Sky – we see a simple bifurcated scape. The sky is activated by what are to be read as clouds, wiggly forms straining towards geometry. A detached grid floats mysteriously across the sky above an area below designated as earth, a plane incised by a network diagonals, some of which are perspectival and others implying an enigmatic functional system. Thus, he has connected the natural and the built environment in a way that suggests their fragile and necessary connection. More importantly, he has isolated the most elemental conditions confronting an architect embarking on design. 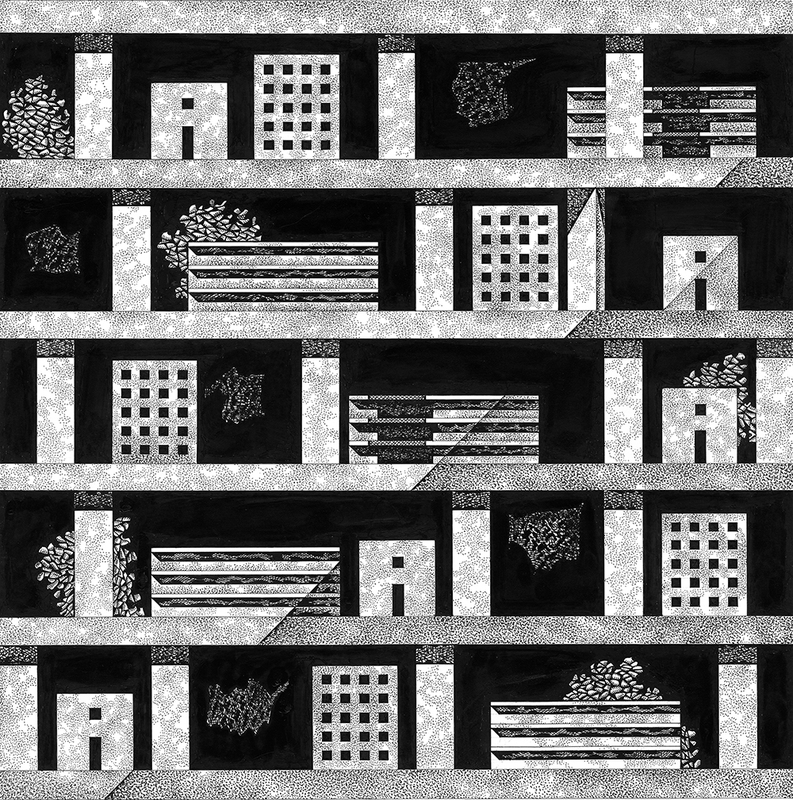 A quiet drama pervades the drawings echoed by their terse titles–The Biographic City, House in the Sky, The Distant City. etc. Each focuses on a single quality or theme. 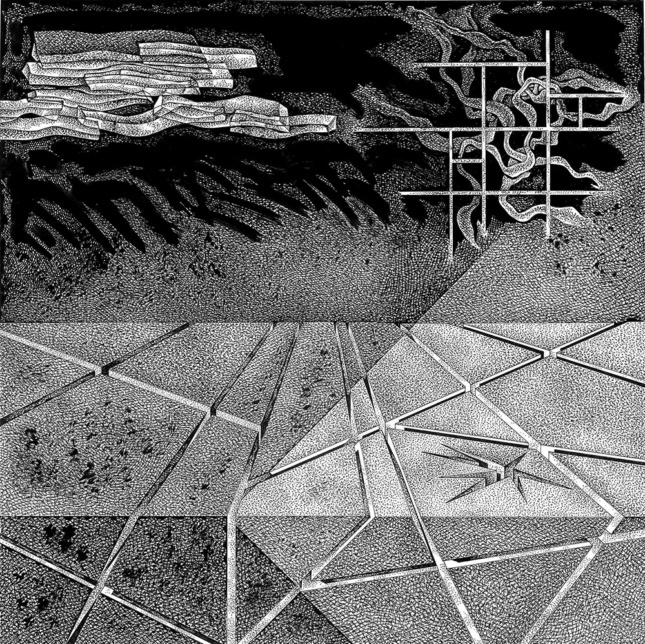 In At the Beginning of Everything (Al Principio di Tutto) one of the denser, more assertive drawings, Purini has deployed a kind of composite collage technique in which fragments suggesting natural rock formations work in dramatic counterpoint to grids and geometric elements. We see a nature from which the language of architecture begins to emerge, revealing his past concern with the rationalism of Terragni inflected by his personal poetry. House in the Sky presents a series of striated levels on which are posited various basic formulations for dwellings – a mono unit represented with door and window, a vertical multi-unit suggested by 20 small square perforations, and a low-rise horizontal unit. The black space in which they reside is punctuated by piers that contribute to the profound sense of geometry moderated by small areas of greenery. Many of his generation explored the possibilities of the Megastructural, as seen in such seminal iconic works as Superstudio’s Continuous Monument. Terrence Riley in The Changing of the Avant Garde: Visionary Drawings of the Gilman Collection from which Purini is noticeably excluded, makes a distinction between the “Megastructuralists” and the emerging postmodernists whom he feels supersede them. “In megastructures a new generation saw potential for the transformation of culture,” which he believes ultimately imploded and was replaced with a postmodern eclectic world of “poetry, psychology, and memory….with a full complement of architectural manifestations: ruins, dreams and monuments. ” For Purini, various themes emerge and are revisited in an ever-evolving progression. They range widely, encompassing many aspects of architectural expression, and it would be inaccurate to think that he would allow one theme to fall into oblivion. The drawings then, become important documents of his ever-transmorgrifying thoughts about architecture, a vision that embraces new technology while reasserting the necessity for an understanding of history. What we see in these shows are not stand-alone drawings. Each participates in a larger series or permutations of a theme. Each represents a clear, chiseled thought that reverberates and provokes further investigation and contemplation.